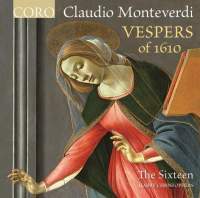 Having released on three separate discs Monteverdi’s late (1641) published collection of sacred music, Selva morale e spirituale (12/10, 8/12, 7/13), Harry Christophers and The Sixteen take the logical step of visiting his much earlier and more famous one – known of course as the Vespers of 1610. The approach is pretty straightforward: a ‘concert-style’ performance with a tutti choir of 22, no extra instrumental doubling, no added chant, and with all the numbers presented in the usual (ie published) order. It thus differs significantly from Christophers’s 1988 version for Hyperion, a liturgical reconstruction of a Vespers for St Barbara with chants, added instrumental sonatas and extensive reordering. The decision whether to perform the ‘Lauda Jerusalem’ and Magnificat at low or high pitch is avoided by offering both (a unique solution on record I think), though Christophers’s personal preference is presumably revealed by the fact the high version is the one in situ, while the low can only be incorporated by means of track reprogramming and a hop or two between discs. The opportunity for direct comparison is interesting, however. At low pitch the sound is undoubtedly richer and the performers more comfortable, while high pitch brings an element of strain but greater intensity of sound. Indeed, in this it rather stands out from the rest of the performance, which avoids the boldly dramatic (a là Gardiner), the swiftly changeable (Alessandrini) or the atmospherically beautiful (Savall). Unfortunately this means more losses than gains. Although there is no doubting the expertise of Christophers’s singers and players, the sum of everyone’s efforts on this occasion is surprisingly bloodless. Christophers’s brisk momentum, cleverly achieved without necessarily taking things all that quickly, works well in the Magnificat but elsewhere rushes many of the music’s more exquisite corners and often fails to realise the work’s grandeur. Above all, it is a pity that some of the soloists had not conveyed the aching eloquence of Monteverdi’s writing more memorably, or in places simply done more to grab their moment. The recorded sound is relatively intimate, not churchy even though recorded in a church, and with a certain graininess to the choral texture. In a piece with so many places that can really excite the listener, this recording left me a little disappointed. There are plenty of others to choose from but if you want a recent one that hits most of the required spots, try Leonardo García Alarcón’s with Cappella Mediterranea and the Namur Chamber Choir on Ambronay (8/14).